This full-color, digest-sized, free publication is perfect for new and returning visitors. Enjoy offline access to maps, amenities, activities and visitor program information for more than 90 incredible Texas destinations. Get yours any state park near you. Texas residents can take the pledge to "Take Care of Texas" and receive a free guide in the mail. 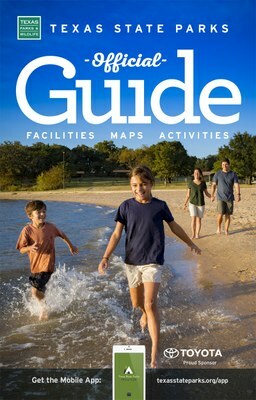 Visitors from any state and almost any country can receive a free Texas Travel Guide in the mail. Advertise with us! (PDF) and reach millions of outdoor-loving Texas travelers. Request guides by mail: up to 3 boxes (100 guides per box).